Best known for publishing Acthung! Cthulhu, the Call of Cthulhu campaign set during World War II, in 2013, Modiphius Entertainment has diversified into board games, miniatures games, and RPGs old and new. The new might be Fragged Empire and the forthcoming Robert E. Howard’s Conan: Adventures in an Age Undreamed Of, the old is definitely Mutant Chronicles: Techno Fantasy Roleplaying Game. Originally published in Sweden in 1993 by Target Games and subsequently translated into English, the setting of the RPG was also developed into a collectible card game, a miniatures wargame, a video game, a film, and more. Following a successful Kickstarter campaign, Modiphius Entertainment has published the Third Edition. With the publication of the Third Edition, the RPG has been given a full development and presentation of the Mutant Chronicles future history and background, a new set of mechanics, and an expanded set of playing options. The new mechanics come courtesy of Jay Little, whose credits include Star Wars Edge of the Empire Roleplaying, the Star Wars Edge of the Empire Beginner Game, Star Wars Age of Rebellion Roleplaying, and Warhammer Fantasy Roleplay 3rd Edition, and new rulebook comes packaged in a dense, full colour, four-hundred-and-ninety-four rulebook. The future history of Mutant Chronicles begins in the late twenty-first century as the competition for depleted resources and environmental collapse drives political power into the hands of four corporations—Bauhaus, Capitol, Imperial, and Mishima. Within two centuries they will have replaced Earth governments, explored and initiated terraforming projects across the inner Solar System, and then evacuated Earth. By the twenty-fifth century, the Germanic and European-influenced Bauhaus has bioengineered Venus into a lush jungle world; the American-influenced Capitol has turned the Martian plains into mankind’s new food basket; the British and Commonwealth-influenced Imperial, more a coalition of smaller corporations and clans has spread itself through the Asteroid Belt; and the Japanese Mishima has made its home on Mercury. At the height of mankind’s technological ‘Golden Age’ with the construction of SolarComm, a Solar System-wide communication system and the first computer intelligences, an Imperial survey mission to Pluto uncovers an artifact that unleashes the ‘Big Scream’ that corrupts A.I.s and advanced electronics, causing the collapse of the intersystem finance system and corporate society, and forcing everyone to downgrade to older, more reliable technology. This is known as the ‘Fall’. In the wake of the ‘Fall’, heightened tensions drive the corporations to armed conflict with each other in the first of a series of corporate wars. Initially, the technological regression caused by the Fall hampers the war, but the discovery of the Rift Drive enables faster travel across the Solar System and spreads the fight. The First Corporate War is brought to end by a new religion that warns of the true threat behind the Fall and the war, the Dark Symmetry. Revealing both this truth and their abilities to combat the Dark Symmetry, known as the ‘Art’, the religion’s founders established The Brotherhood in 2580 AD and with it the beginning of a new calendar. Even as Nathaniel Durand, the first Cardinal of the Brotherhood preached against the Dark Symmetry, the First Seal of Repulsion would be broken within a decade on the newly discovered planet of Nero and unleash its physical power—the Dark Legions. Led by four Dark Apostles—Ilian, Mistress of the Dark Symmetry, Algeroth, Apostle of War, Muawijhe, the Apostle of Madness, and Semai, the Apostle of Spite—Dark Citadels are dropped upon world upon world to unleash horrifying armies that spread chaos and horror. The armies of the Dark Apostles are comprised of Legionnaires, the resurrected corpses of fallen soldiery; the humanoid, though hideously modified Necromutants; the towering and much feared humanoids known as Nepharites; and the Centurions, the field commanders for the Apostles. Only by cooperating with each other and the Brotherhood are the Dark Legions driven back. The Dark Legions would openly attack humanity twice more over the course of the next millennium and continue to lure humanity with promises of great power at other times. Although they would also go to war with each other also, the corporations were driven to work together, even going so far as to form the Cartel, a neutral venue to handle diplomatic relations and coordinate military and law enforcement activities. This includes the elite Doomtroopers, soldiers recruited from the best of the corporations’ militaries, and Luna PD, charged to keep the peace in Luna City, now regarded as mankind’s new home. They are also joined by two new corporations, Whitestar, a Russian corporation that has survived the nuclear winter on Earth, and Cybertronic, a secretive corporation distrusted for its use of advanced technologies and artificial intelligences. This is set-up for Mutant Chronicles, an RPG of inter-corporate rivalry and conflict whilst under the threat of a corrupting evil. Campaigns can focus on the corporate conflict and espionage; on the fight against the Dark Legions with the corporations or Doomtroopers; on protecting mankind as Luna PD operatives or Brotherhood acolytes; and more. The RPG allows for play during more than one era—the Dark Legion era, a millennium after the founding of the Brotherhood and the original period for Mutant Chronicles; the Dark Symmetry era that runs from a period of high technology through the Fall and beyond; and the Dark Eden era, a time of high conflict which is only hinted at in the core rules. Mutant Chronicles supports this with detailed background material for each the corporations—Bauhaus, Capitol, cybertronic, Imperial, and Mishima—as well each of the other factions. This includes the Brotherhood, Luna PD—the city of Luna is also detailed and given a map, the Cartel, and Whitestar, plus each of the Dark Apostles and their Dark Legions. Although there are sourcebooks forthcoming for the RPG and its various factions, there is enough information here to support various styles of games, whether fighting the Dark Legions or fighting between the corporations. Potential iconic roles possible for the player characters include Heretics; Inquisitors, Mortificators, and Mystics of the Brotherhood; Conquistadors—explorers, spies, and traders; Murders & Acquisitions Agents or Blood Berets—both working for Imperial; Corporate Samurai, Shadow Walkers, or Triad Enforcers of Mishima; Technological Archaeologists, Security, Warfare, and Intelligence Cyber-Infiltrators, and Cyberscientists of Cybertronic; Bone Hussars, Resectors, and Night Witches of Whitestar; Luna PD Detectives and Doomtroopers of Luna PD and the Cartel; Celebrities, Politicians, and Freedom Brigade soldiers of Capitol; and Venusian Marshals, Merchant Captains, and Rakes of Bauhaus. All these roles are available to play in Mutant Chronicles. A character in Mutant Chronicles is defined by eight attributes—Agility, Awareness, Coordination, Intelligence, Mental Strength, Personality, Physique and Strength. They typically range between six and twelve with higher values being better. He will also have any number of skills, each defined by two factors, Expertise and Focus. Expertise represents general training, whilst Focus is disciplined practice necessary to most of a skill. Both range between one and three, but a character can have up to three signature skills that can have an Expertise and a Focus of five each. In addition many skills have associated Talents. For example, the Survival skill related Talents begin with ‘Self Sufficient’ and have ‘Risks’ ‘Remedies’, and ‘Rewards’ on one branch, ‘Tracker’ on the second, and ‘Scrounger’ and ‘Provider’ on the third. Most Talents have prerequisites in terms of skills and often Talents too. Creating a character in Mutant Chronicles involves putting him through a Lifepath consisting of eight decisions. Taking a character through all eight decisions—Attributes, Birth Faction, Status, Environment, Education, Primary Career, and Iconic Careers—generates his background, attributes, skills, and talents. Throughout a player is free to choose from the options available in terms of attributes, skills, and talents, but each time a decision comes up, a player must decide to roll randomly to determine what happens, although certain decisions, such as those related to a character’s careers, he can instead spend a Life point to choose himself. The latter is the only way of creating certain types of character, for example, a member of the Brotherhood. Life points can also be spent to take more careers. Any Life points left unspent at the end of the process can be used to improve the Expertise or Focus of any skill or to purchase assets. Our sample character is Harold Jones, a Blood Beret with ten years service with Imperial military, two of them as a Blood Beret. He was conscripted into the military in return for the remainder of his prison sentence being commuted. The exact details of his crime has been sealed. Part of the sentence being commuted also involved medical research, but exactly what Jones does not know. Mutant Chronicles uses the 2d20 System—and was the first to do so. Simply each time a character wants to take an action, he rolls two twenty-sided dice, aiming to roll low. This roll is made against an attribute or against an attribute plus the Expertise value of a skill. Each roll under this value generates a success. Further successes can be generated if the roll is also under the Focus value of a skill. The number of successes are measured against the Difficulty Rating of the task, one being average. Any successes generated above the Difficulty Rating are counted as Momentum and these can be spent for various effects. For example, to learn more information, reduce time taken, improve the quality of the check, and so on, whilst in combat they could be used to increase the damage, target a specific area, or disarm an opponent. A player character also has access to Chronicle Points. A player character typically enters play with between two and four of these and can earn more for good roleplaying, clever plans, teamwork, overcoming challenges, and so on. When spent they can be used to add an extra twenty-sided die and gain an automatic success of one; perform an additional action; and recover from Light Wounds. For example, Harold Jones needs to fix a truck fast. The GM assigns it a Difficulty Rating of one. Harold’s target is twelve—equal to his Intelligence plus the Expertise value for his Mechanic skill—and rolls two twenty-sided dice. He rolls a 9 and a 1. The 9 is a success, but the 1 is equal to Harold’s Focus for the skill and this not only generates a success, it generates an extra success. Harold has three successes. These are counted against the task’s Difficulty Rating and the excess gives him two Momentum to spend. Harold spends one to improve the quality of the repair—it will hold if the truck gets damaged—and the other to cut the time taken to do the repair. Where the players have their Chronicle Points, the GM has a pool of Dark Symmetry points. These are gained when a player character suffers repercussions after a failed skill roll—invariably when a natural twenty is rolled, decides to voluntarily fail rather than fail badly because the odds are against him, or needs more dice to roll on a difficult skill check. They can also be gained from dark artefacts or cursed locations, and there are even enemies that can generate them. The GM can then spend them to activate NPC abilities, interrupt the player characters with a complication, or to trigger a complication. Besides the standard twenty-sided dice, Mutant Chronicles uses Dark Symmetry dice. These are six-sided dice where only the rolls of one, two, or six count. In general, they are used as effect dice, for example, when rolling damage in combat. Here rolls of one and two represent extra damage and rolls of six trigger special effects. The dice themselves are marked with one and two star-like symbols and then the Dark Symmetry symbol for the six. The dice have the numbers three, four, and five on them, but these have no effect and are ignored. The rules are quite complex, which is no surprise given what they have to cover and the RPG’s origins. So combat has to not only detail fights between individuals, but also between vehicles and between spacecraft, and not just madness, but also the possibility and effects of corruption and falling into darkness. The corruptive influence of the Dark Symmetry will constantly weigh upon the minds of the player characters when they find themselves facing its servants. For the corrupt and heretical cultists of the Dark Symmetry and its Apostles, there are some nasty ‘Gifts’ they can be granted. These are of course intended for use by the NPCs, but should a player character fall prey to the Dark Symmetry… Each of the Apostles and the various soldiery of their Legions are also described and detailed. Fortunately, the player characters have plenty of guns to array against the Dark Legions—and Mutant Chronicles includes an extensive list of arms and armour with which to equip the militaries of the five corporations and the four Drak Legions, and also the player characters—but when they fail, there is also the Art of the Light. Most of its practitioners are inducted into the Brotherhood in childhood and given further training, learning how to cast an array of spells and to spot the influence of the Dark Symmetry. A few spells are known to all Mystics of the Brotherhood, but most are broken into Aspects, including Kinetics, Mentalism, Exorcism, and Manipulation. Like skills, each Aspect has its own associated Talents. Mysticism and membership of the Brotherhood is only open to the player characters during character generation and a Mystic character has to be wholly designed rather than be left to chance. Our sample member of the Brotherhood grew up sequestered on Earth in a wealthy Whitestar affiliated family until the Brotherhood came for her. Bronya does not know why her parents did not refuse the Brotherhood’s request, but wonders if this was due to the strange ability she has to mimic the abilities of others… Prior to being appointed as a Mystic, Bronya has spent a relatively cloistered life, although in order to gain an understanding of life for the common man, she has worked for two years as a Medical Responder in Luna City. Primary Career Event: Someone is keeping an eye on me! As well as the extensive background to the setting and factions of Mutant Chronicles, including a map and lengthy description of Luna City, the GM is given numerous NPC descriptions and write-ups that can be found throughout the book. These nicely colour and a personal touch to the setting. The GM is also accorded extensive advice and support that covers how to run the game and how to be a GM; how to set up and run scenes, for example, chase, investigation, and exploration scenes; the types of games that can be run, such as character drama, action and heroics, hardboiled investigation, and merciless boardroom; and the types of campaign that can be run. Of course being a larger book allows Mutant Chronicles to explore all of this in some detail and in the process really help a GM set up his Mutant Chronicles game. Physically, Mutant Chronicles is a dense, full colour hardback. The book is well written and organised, in particular, the secrets of the setting being very clearly marked. Though their placement, sometimes a bit too close to information that will be read by the players, like that of the secrets of the setting’s timeline, which is placed very close to the front of the book. If anything lets down the presentation of Mutant Chronicles, it is the variable quality of the book’s artwork. Much of it is very good and captures the scale, feel, and horror of the setting, but elsewhere it is often too cartoon-like in style, especially in its depiction of the oversize shoulder pads that seem to proliferate the artwork. Mutant Chronicles draws comparison with two other RPGs. One is Fantasy Flight Games' Dark Heresy, the other is Fading Suns from Holistic Designs. All three possess similar elements—societies that have suffered traumas and infighting, high technologies that have been lost or discarded, and religions that are fundamental to seeking out and thwarting an evil that threatens to destroy mankind. Both Fading Suns and Dark Heresy are baroque in tone and feel, both are set in the far, far future, both are set across multiple star systems, plus the setting of Dark Heresy involves more traditional fantasy elements, such as Orcs and Elves and so on… In comparison, Mutant Chronicles is set in a relatively more immediate future, is limited to just the Solar System, its threats are of a familiar nature, and so the setting is much, much more accessible. Another aspect that separates Mutant Chronicles is its approach to technology. It ‘Dieselpunk’ aesthetic is not just for show. In the future of the Mutant Chronicles, technology has regress because of the ability of the Dark Symmetry to subvert sophisticated electronics, forcing society to rely on heavier, bulkier, and sturdier designs more akin to that of the mid-twentieth century. Advanced, sometimes ancient technology does exist—and later in the setting sophisticated technology does make a return with the foundation of Cybertronic—it is still feared for its ‘unreliability’ and its ‘untrustworthiness’. 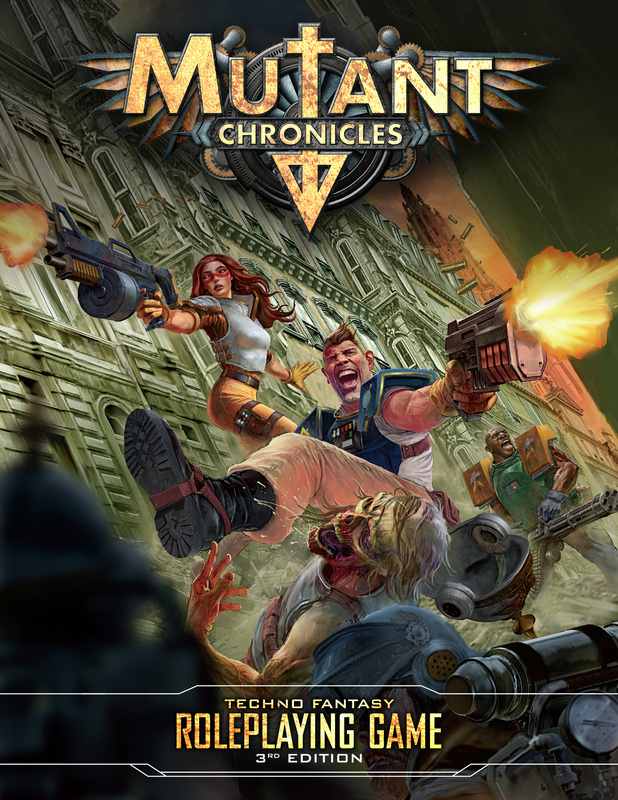 Despite the redesign, Mutant Chronicles still cannot escape a certain sense of familiarity in terms of tone and setting. This is of course due to its set-up of inter-corporate rivalries in the face of a bigger, external threat, which comes from it being based upon a miniatures wargame and thus the wargame needing reasons for the factions and thus the players to fight. The bigger, external threat, Dark Symmetry and its Dark Legions, provide much of the tone, the need for the grime and the diesel-punk grit, a demonic evil represented a ‘four horsemen of the apocalypse’ (from another dimension), but without the need for inherent chaos or spikes. If the Mutant Chronicles RPG of the 1990s was really an adjunct to the miniatures game, Modiphius Entertainment’s Mutant Chronicles: Techno Fantasy Roleplaying Game is a muscular redevelopment, presenting a set of rules that provide the grit and the detail you would want from a wargame-inspired RPG, yet still with capacity for cinematic play and player input via the application of Momentum. This is backed up with background, NPCs, and inspiration in abundance. 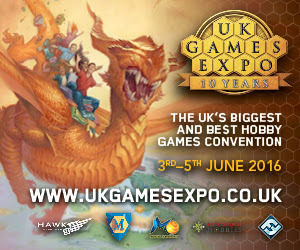 Modiphius Entertainment will be at UK Games Expo.